In this module, we will culture microbe colonies from our soil samples in order to determine what is living in our soil. In biology, a colony refers to several individual organisms of the same species living closely together, usually for mutual benefit. 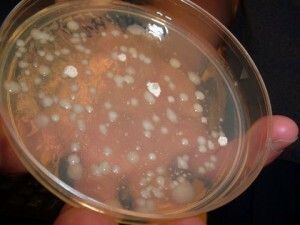 Figure 3.26: A microbial culture on a Petri dish. A bacterial colony (or colony of other microorganisms) is a cluster of organisms growing on the surface of or within a solid medium, usually cultured from a single cell. Because all organisms within the colony descend from a single ancestor, they are genetically identical (except for mutations which occur at a low, unavoidable frequency). By culturing microbes, multiplying microbes by letting them reproduce in predetermined culture media under controlled lab conditions, scientists can create colonies for study. Microbial cultures are used to determine the type of organism, its abundance in the sample being tested, or both. It is one of the primary techniques of microbiology. In microbiology research, it is often essential to isolate a pure culture of microbes. A pure culture is a population of cells or multicellular organisms growing in the absence of other species or types. A pure culture may originate from a single cell or single organism, in which case the cells are genetic clones of one another. Most organisms in the soil are “viable but not culturable,” meaning that we don’t know how to grow 99% of the species on the planet!